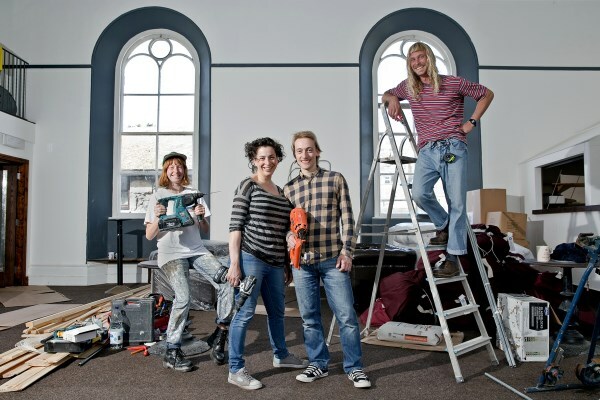 Formerly known as the Wesleyan Youth Hostel and then as St Ives Backpackers, we (Lee & Dan Strickland) took it over in January 2015 after falling utterly in love with the space and character of the building. We closed St Ives Backpackers the day we got the keys and embarked on a manic period of renovation, redecoration and rebranding in order to open in April 2015. Cohort inhabits a Grade II listed building which was formerly a Wesleyan Chapel and Schoolrooms. Built in 1854 the building retained its original use for over 100 years until 1962 when the Methodist Church turned it into a youth hostel. It was sold on the open market in 1997 to much controversy and has remained a youth hostel ever since. The bottom of the original school rooms building is occupied by the award winning theatre company Kidz R Us and the top of it, along with the old chapel building, is Cohort Hostel. The definition of Cohort is ‘a gang of people having a shared experience‘ and that summed up how we wanted our guests to feel about staying in the hostel. Sociable and friendly, experiential and comfortable – we want everyone who stays with us to feel as though they have experienced something new – whether it’s discovering St Ives in all its 5-beached, arty glory or meeting new people over a drink in the bar: It’s what we love about independent travel and what we want people to love about staying with us. During our travels (independently and together) we’ve hung towels around dorm beds for privacy so at Cohort we made curtains for each bed; we’ve been frustrated at WiFi only being available in communal areas so we’ve ensured that you’re connected to ours wherever you are in the building. We’ve rolled our eyeballs at a lack of plugs and places to charge up our phones so at Cohort we’ve made sure that every bed has its own plug socket and USB port. We’ve looked longingly at expensive resorts wishing we could stay there so we want to keep Cohort cheap enough to be affordable for anyone on a budget. Inevitably our ambition outruns our resources by quite a long way and to that end Cohort is still a work in progress. We really do welcome feedback because this is your experience and your holiday and we want to make sure that Cohort has everything you need. We are only two people and you are many… we look forward to meeting you. Cohort is proud to be part of the Independent Hostel network.